I’ve had serious recipe block recently. Everything is so gosh-darn perfect at the farmer’s market that it needs no help. Take corn. It only needs to be roasted and then rubbed with a little butter and sprinkled with salt and pepper. Tomatoes don’t even need vinegar. Simply splash thick slices with a little olive oil and some sliced basil and you have a delicious side. I don’t even want to talk about the peaches which I’ve bought every week this summer with the goal of making peach pie, but instead have eaten fresh as anything else would be gilding the lily. Perhaps all this perfection was what made me scoop up a couple of green tomatoes yesterday. Tangy and firm to the touch, those unripe tomatoes were something that required my attention; something that for all their goodness could be improved upon. As I picked out the best of the lot, I knew immediately what I was going to with them. I’ve had the joy of working with a recent Johnson & Wales graduate (and Davidson alumna!) this summer and yesterday she was reminiscing about buttermilk dressing that her family use to buy when she was a child. Sold in a tiny milk jug, it had certainly left its mark on her as you could almost taste that classic combination of cream and tang as she described it. As I looked for blemishes on each tomato, I envisioned the fried green tomato salad with buttermilk dressing that would be my summertime lunch the next day. The tomatoes in this salad are thinly sliced, dredged in flour and then dipped in buttermilk, before receiving a final dusting of cornmeal. Fried to golden-brown crispiness, they are paired with fresh grape tomatoes and drizzled with a tangy buttermilk-dill dressing that is thin enough to soak into the crispy crust of each green tomato. Yes, this recipe requires a little work, but after weeks of hands-off cooking, I ‘m happy to be behind the stove again. 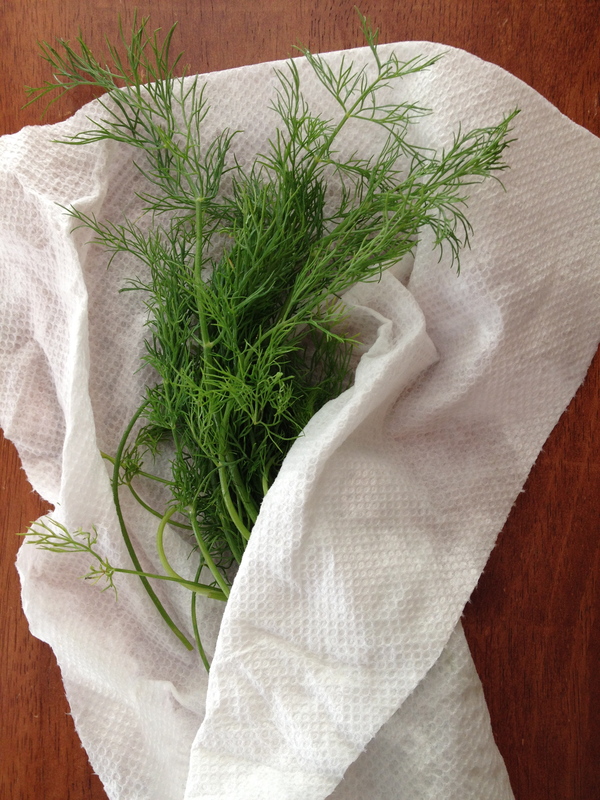 I love using dill for the dressing, but fresh chives would make a fine substitution if you were so inclined. A smattering of thinly sliced green onions over the salad is also a nice touch. 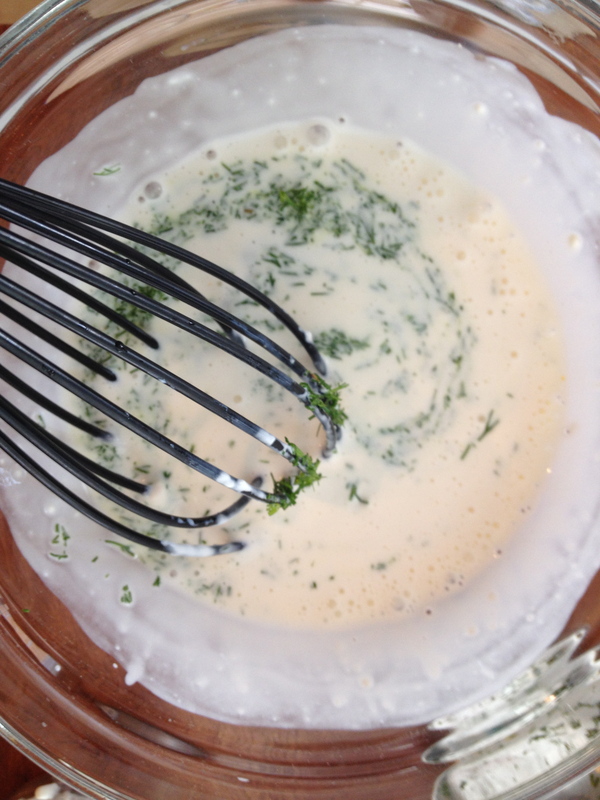 Whisk together the buttermilk and mayonnaise in a small bowl. Add 3 tablespoons of the white wine vinegar and taste. Add more vinegar if desired and then stir in the dill. Season to taste with salt and pepper. In a small bowl, whisk together the cornmeal, salt, black pepper, and cayenne. Set aside. Place the buttermilk in a small bowl and place the flour on a small plate. Working with one slice of tomato at a time, dredge the tomato slices in the flour and shake off any excess. 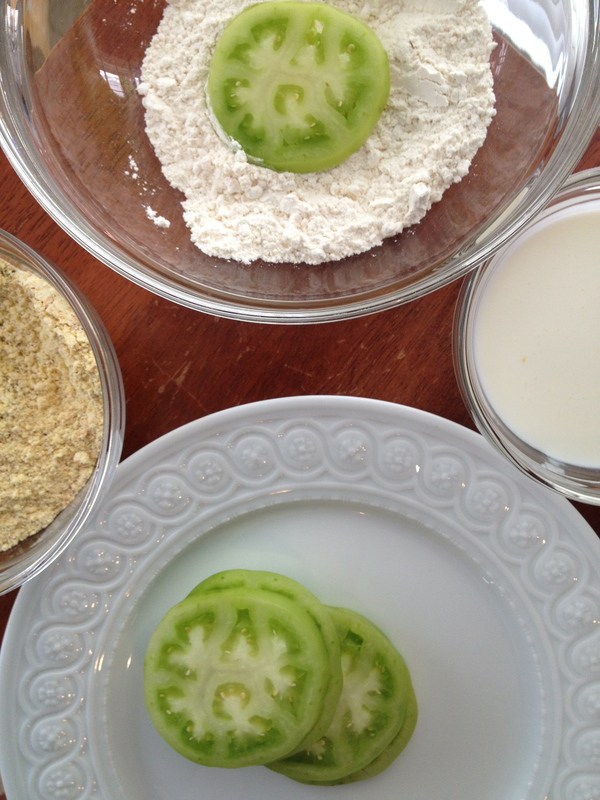 Dip the tomato slices in the buttermilk and then dredge them in the cornmeal mixture. Set on a plate until all the slices have been breaded. Fry the tomatoes in 2-3 batches (the oil should come about halfway up the side of the tomato slices) until golden brown, about 2 minutes on each side. 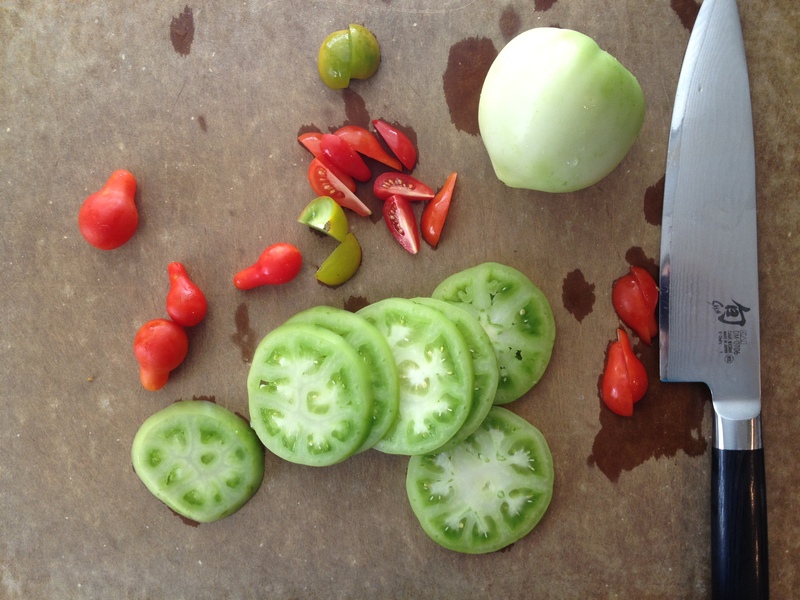 Carefully remove the fried green tomatoes with a slotted spatula and set on a paper-towel lined plate. Continue until all the tomato slices have been fried. To assemble the salad, divide the mixed greens between four salad plates. 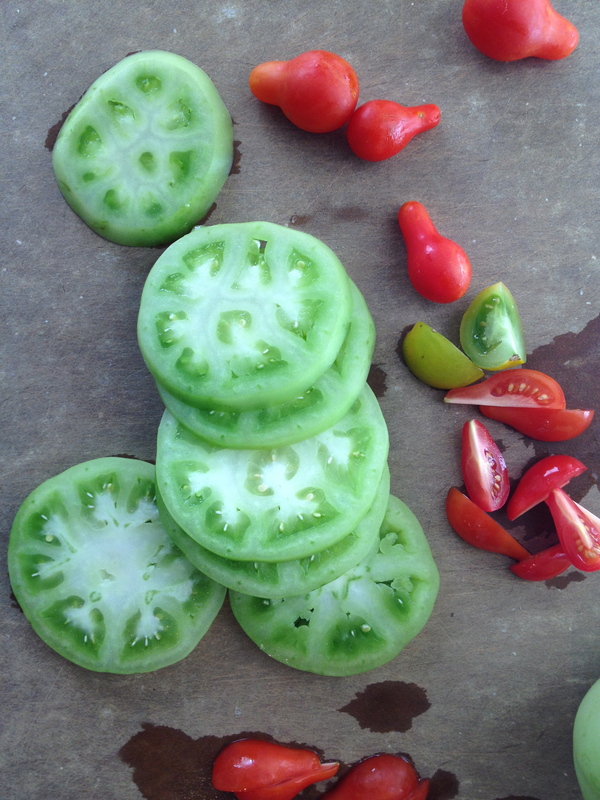 Divide the fried green tomatoes between the salad plates and arrange them decoratively. 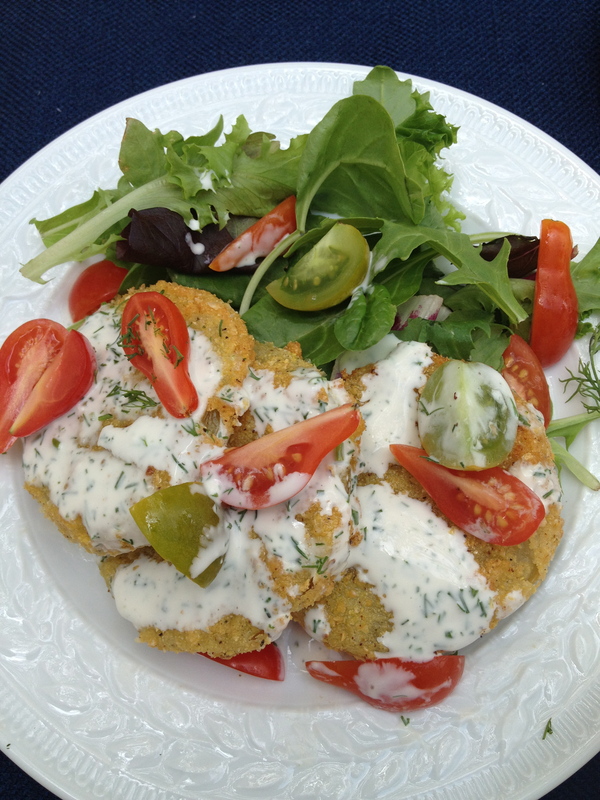 Sprinkle the fried green tomatoes and the mixed greens with the quartered grape tomatoes. Drizzle everything with the buttermilk-dill dressing. Serve immediately. What a great reason to buy some buttermilk!